General Trip Itinerary to reach Leh from Delhi. Day 1 : Delhi-Manali overnight by Volvo. You will reach manali by 9am. Day 2 : Check out Manali & take a 1/2am Cab to Leh (in case you are short of time otherwise bike trip is recommended)..
Day 3 : On the Way to Leh, overnight stay at Jispa in tents. Day 4 : Jispa to Leh. Biking into and around Ladakh is the Holy Grail of biker-trails anywhere in the world and hence not just Indians but foreign tourists in overwhelming number choose to travel to Ladakh on a motorbike. One can plan the trip by three ways. 1st : By Flite : Would cost you something around 12-13K one way and if booked early can cost you as less as 6K as well. 2nd : By Taxi/Cab/Tempo Traveller : Will cost you around 1800-2000 per head for one way journey which takes around 18-20 hours.This is not recommended as one needs time as well to get accustomed to higher altitude. These vehicles will start at around 1/2am in the night(so that they can avoid the early morning traffic on Leh-Manali Route). 3rd : Bike Rentals : This will cost your around 10-12K + Security deposit one way and will take 1-2 days depending upon the way one would want to ride. In Manali market, you can find lots of shops. Be sure to check the bikes before as well. Ladakh is also referred to as Land of Lamas and if you are traveling by road and observing enough then there are a number of warning signs erected by BRO advising “Don’t be a Gama in the Land of Lamas”. At one curve the road sign read “Be Gentle on My Curves” cautioning riders to drive slow and safe. Below pic says the same as well. One can find camps near Jispa to stay overnight as well.Other places for Tents/ Camps are Darcha, Zingzing Bar, Bharatpur, Sarchu (Many options), Pang. This road is usually is open for only about four and a half months in a year in summer between May or June, when the snow is cleared by the Border Roads Organisation of Indian army, and mid-October when snowfall again blocks it. The most sought after places on the route are are Taglangla pass(2nd highest pass of the world and also on the highest altitude on the route),Rohtang Pass(you can expect heavy jam on this route & is closed for more than six months in the winter months due to heavy snowfall),Keylong(biggest town on Leh Manali Highway) and Jispa (most preferredn night saty after Darcha when you are coming from Manali)among others. Driving on, the urge to stop after every 500 meters is irresistible. The stunning scenery, stark landscape and floating clouds across azure sky are simply out of the world experience as one rides on towards Leh. 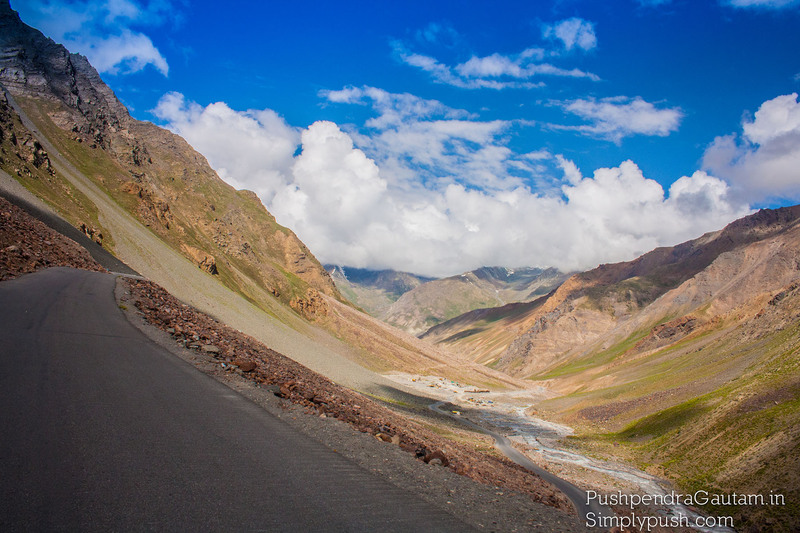 The Leh Manali journey has epic written all over it. With roads that open up for only a few months a year, these 470 km will test you, scare you, shock you and leave you spellbound. Please excuse me if you become spellbound(after reaching Leh while you’re yet to explore more places). 1. Petrol Pumps on Leh Manali Route : Tandi (107 KMs from Manali), Karu (36 KMs from Leh). 2. Tents/Camps for stay : Jispa, Darcha, Zingzing Bar, Bharatpur, Sarchu (Many options), Pang. 3. Mobile Connectivity : BSNL is the best and second best is Airtel. Also no prepaid conencts work in Leh Ladakh Regions. 4. Medical Facilities : Sissu, Keylong. 5. ATMs	: Keylong (only in Leh Manali route). 6. Mechanic / Puncture Shop : Marhi,Keylong, Darcha, Sarchu.